This chapter introduces the concept of e-business and explores how communications technology is revolutionizing the way individuals and organizations conduct business. As organizations venture down this path, driving their business processes with electronic communications, the trail of paper including invoices, check payments, and so forth quickly disappears. 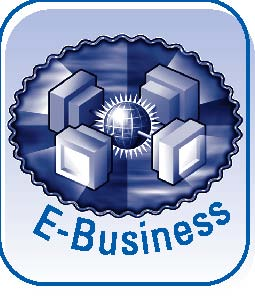 E-business captures business event data at the connection with a customer or supplier. Enterprise systems store data and make it readily accessible to all who need it. The evolution to e-business had been a rather slow process before the advent of the Internet, which has switched the evolution into high gear. As you study this chapter, you will learn about the underlying technologies that facilitate e-business, the complexities of displacing paper records with electronic ones, the challenges faced in overcoming differences in technology usage and Information Systems design in order to link two companies’ computer systems together, and finally the actions that must be taken to ensure that e-business conducted over the Internet is secure. All of these technologies, along with the flexible processes they allow to exist, are fundamental to providing companies like Caterpillar with the capability to implement new streamlined processes and to create build-to-order service for its customers.